Holly Brooks is no ordinary story. She grew up in Seattle (“towards the end of the Seattle grunge scene”) and attended a small alternative school with classmates who smoked, worshipped Courtney Love, and thought nordic skiing was the name of a Swedish rock band. Her own high school had few sports, so she played soccer and ran track for a larger school that was nearby. When she first started skiing, it was with her family, who would drive to find snow on the weekends. Holly skied for Whitman College, but didn’t get much racing experience and never raced at NCAA’s. 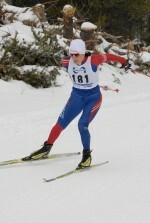 Whitman was part of USCSA (United States Collegiate Skiing Association) for her freshman and sophomore years, so the team only competed in a handful of races outside of USCSA “nationals” in those years. In her junior year at college Holly did a study abroad called “Semester in the West” where she describes her experience as, “. . . on the ground in a sleeping bag for three straight months. To train I would wake up at 5:30am, brush the frost off my sleeping bag, and roller ski wherever we happened to be at the time….. roller skiing in Dinosaur National Monument anyone? It was a wonderful way to experience the West but I wasn’t in shape that winter. ” She also missed out on NCAA’s her senior year when a sinus infection ended her season. After college Holly coached at the Maine Winter Sports Center and then moved up to Anchorage, Alaska (a move which was supposed to be temporary) to coach for the Alaska Winter Stars. She then became the head coach of West High School before taking her current job at APU (Alaska Pacific University), where she coaches the junior, masters, and Women’s-only programs. In 2008 she discovered that she could ski pretty darn fast by winning the Tour of Anchorage marathon. The next season she narrowly missed a victory in the American Birkebeiner in a finish line sprint, but again won the Tour of Anchorage. In the summer between she won the Alaska Mountain Running Cup as the top competitor in a half dozen grueling mountain races. This summer she encountered a bit of a setback when she developed a rare condition which made her collapse near the end of the 4th of July Mount Marathon Race (an up and downhill mountain race which she was winning at the time). It took her several weeks to be able to train again, and a couple months to fully recover. She did, however, recover enough in the week after the race to complete her marriage vows to Rob Whitney. Whitney is also a well-known name on the ski circuit (seven JO titles, twice World Champ team, two top tens at World Juniors, and Univ. of Utah All-American). Holly and Rob were married at a local alpine ski area, and sources tell me that at 3 am that chilly AK morning there were 3 dozen wedding guests, mostly nordic skiers , who ran to the top of the alpine hill to howl at the moon – buck naked. Last weekend Holly started the ski season at the West Yellowstone Super Tours with a bang, grabbing a victory in the 10km skate race, 4th in the sprint qualifier, and 2nd in the 5km classic. You grew up in Seattle, which does not sound like a nordic paradise. How did you get into the sport initially and what fueled your passion for the sport? You’re right – Seattle in NOT a great place to be a Nordic skier. Snow is far away and streets for roller skiing are hilly and often have stop signs and turns at the bottom of them – add that to the fact that everyone thinks you’re a freak show and it’s not a very opportunistic place to excel in our sport! I got into cross country skiing through my family. We own a cabin at Snowqualmie Pass, approximately an hour East of Seattle. We spent the weekends skiing at the ski area and then we would ski 3k into our cabin to spend the night. I grew up skiing with a backpack on in the dark. . . . My dad was my coach and I skied with my siblings and a few other random skiers from the greater Seattle area. I would have killed to have a high school team and friends my own age to train with. My Alaskan Juniors have no idea how lucky they are! As a junior, did you ever see yourself becoming an elite skier, winning marathons and competing to be on the Olympic Team? I’ve heard reports that you started coaching at a young age by taking your siblings out for long ski excursions. Have you always wanted to be a coach, or did you ever see yourself in another career, perhaps using your Environmental Studies degree? I’ve always loved coaching – I think I started helping out with the little kids program (coaching 6 year olds) when I was 11 or 12. I had a bright pink, green, and blue ski instructor’s jacket (which was TOTALLY cool in the early Nineties!) that reached below my knees. I hung out with the other adult ski instructors – or at least they tolerated me. Growing up I wanted to be a teacher…. But then I realized, why not teach the thing that you’re most passionate about? You are coaching three different programs at APU – do you ever get a good workout in as a coach or do you mostly have to train on the side? I coach the APU juniors, the “Noon Master’s group”, and a women’s only group – it adds up to as many as 10-14 sessions per week. I spend a LOT of time on snow for work… I would be lying if I said that I didn’t think it helped me….. but I have to fit in additional training sessions on my own time. I actually recently wrote an article titled “Life Inside a Sweaty Sports Bra” because between coaching and training myself, I’m on and off snow for 8-12 hours per day, everyday. Add that to office work and I’m more or less exhausted most of the time. Does your husband, Rob, train with you often? Two years ago Rob was twenty pounds overweight and we were PERFECT training partners because it slowed him down. Now he’s in better shape and often too impatient to wait for me. Plus, we have very different work schedules which is frustrating. In the off season we do a lot of adventures in Alaska together whether it’s backcountry skiing, peak bagging, kayaking, pack-rafting, or crust skiing…. I think that those expeditions are better training that anyone realizes. Rob pushes the pace and I try to keep up. You are part of a group called OIA – what is that exactly and how are you involved? OIA is a big group of friends that values being fit and having fun. I train with them (yeah Tuesday night circuits!) and I hang out with them. Most everyone in the group is a working professional who loves to ski and run. It’s a fabulous group of people that keep things fun and fresh. We even have spandex –its STILL AWESOME. To clarify it stands for “Only in Alaska.” Not sometime else. I know Rob designs training plans for some OIA skiers – does he help design yours? Do you ever disagree with some of his ideas on training or racing? I generally follow the APU training plan with lots of flexibility for coaching my sessions. (For example, it may be an elite team recovery week but I still have to be out on the trails multiple times per day….) Rob definitely looks over my shoulder and adds his two cents but in his ideal world I would spend half the time in the weight room doing jerks and cleans. Needless to say…. We disagree on a couple of things 🙂 That said, I am eternally greatful to have a husband who understands what it takes to be a ski racer. Rob provides me with amazing support – for this Super Tour trip he made me a good luck movie. I am a very lucky girl…..
Exertional Rhabdomyolosis – yes, Brent had the same thing. It’s not very common for fit people – it happens more often to people who are out of shape who work out to hard… or, it even happens to people in car accidents. The combination of the heat, depleting glycogen on the Mt. Marathon uphill, and the severe eccentric movements of running down a cliff did it to us…. Both Brent and I have a fairly high pain tolerance. ….. It seems to me that your results have really made a jump in the last couple of years, culminating in your Tour of Anchorage wins, a near-win at the Birkie last year, a 4th at distance nationals, and your victories in the AK mountain running series. I thought you were at your fittest this summer, right before your injury in the Mount Marathon race. Two questions here: How do you feel about your timeline as an athlete, and what has contributed to your successes? and: What has your recovery been like, as far as getting back to training and racing at the level you had been at before the injury? It’s pretty simple, I relate my success to training hard every day, for a couple of years now. This is my fourth season at APU and I’ve spent the last four years trying to figure out how to make skiers faster, myself included…. I coach my sessions and do additional workouts outside of coaching. I’ve never had much time to race so I suppose you could say that I didn’t know what I was capable of. Maybe my timing is perfect, I don’t know? The recovery this summer was tough. I ran Mt. Marathon (and got injured) a week before my wedding. I didn’t have much time for a proper diagnosis, let alone to take care of myself. After my wedding we went on our Mini-moon, pack rafting and hiking in Wrangells St. Elias Mountains. It wasn’t until that trip was over that I realized what was wrong with me. Skiers are taught to deal with pain and not “Wuss out” or complain. Maybe I should have been more concerned when I couldn’t bend my leg more than 10 degrees at my own wedding! Once I realized that I had a serious condition I was became very proactive. I had an MRI done to see muscle damage, I went in for numerous blood tests, and I coached with my coffee is hand on the side of trail (not usually my style!) I usually participate in lots of running races in the fall but this year I just concentrated on getting better. Is “exertional rhabdomyolosis” a random condition, or can you – and others – learn from it? “Rhabdo” as we call it is rare but it has definitely made me more aware of hydration. Noah Hoffman had an excellent piece in your “training tips” section a while back. I would urge everyone to read it. Which races are you focused on this fall and early winter? Super Tours, Silver Star, and US Nationals – after that, we’ll see. Will you continue to coach full-time? If so, how will you balance your own racing with your duties as a coach? I want too – I love coaching. Luckily, at APU we have five full time coaches and two part time coaches, all who are very knowledgeable and capable of coaching our many groups. I think it’s important that we all take time to travel outside of Alaska for skiing whether it’s racing, coaching, or a combination of both. I really care about the people that I work with and they have offered me tremendous support in return. I think that every elite racer could benefit from coaching. Not only do you give something back to the sport you love but it makes you think about what you’re doing it – and why. As both a coach and an athlete yourself, what is one thing that you really harp on your own athletes to do that you are not good at getting done yourself? Rest and Recover. I often don’t have time to do it myself.